This week a somewhat curly B embroidered in a mid blue thread. It’s really quite liberating researching these letters as you realise that pretty much anything goes as to the details of letter formation as long as the overall shape is discernible – in this case two near circular curves. I don’t know why I opted for the style I did, except that I think I was taken with the idea that the arms forming the curves looked like they could be untangled from each other like the tendrils of a honeysuckle or clematis. 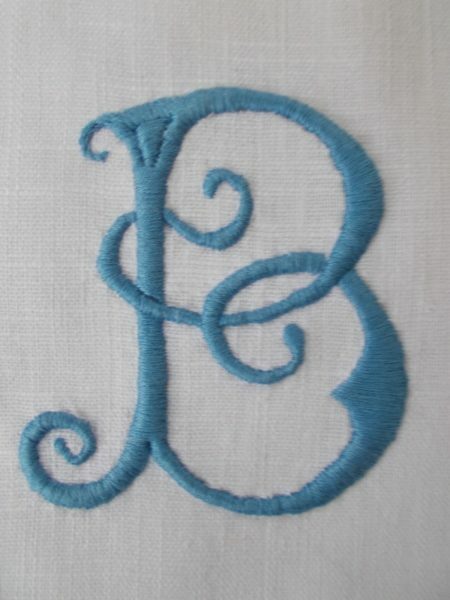 One of my favourite monograms is the B & J (see below) which comes from an old piece of linen. The design has a balance and rhythm you’d never tire of looking at – and though obviously the letters B & J, together they have something of the abstractness ofIslamic calligraphy too. Every day we are reminded how advancing technology and social media confront us with new problems for which there is often no easy solution. While the news is full of the biggest of these problems, little blogs, like this, throw up a few small problems which we can either ignore or muddle through to some sort of conclusion. For example, sometimes blogs come to an abrupt and sudden halt. From time to time you check in to see if there is anything new and years can pass. It’s true you can email these blogs and enquire if they are well, although if their last post is headed something like ‘Trouble at work’ or if it contains news of a serious hospital visit, I ‘m inclined not to do this. (The first example I think took to Instagram in a big way but I have a feeling that the hospital visit mentioned in the second example did not end well since there have been no posts since 2012.) When the garden writer (The Guardian and Sunday Telegraph) Elspeth Thompson took her own life in 2010, her husband told us so on her blog which he then signed off appropriately – although I now notice that the blog is marked “private by the owner” and you have to request permission to look at it. In the case of my own blog I have noticed people wh0 used regularly to comment, disappear quite suddenly. After a few months I found I missed them, ever so slightly grieved for their absence and then wondered if something dreadful had befallen them. Once again, there is no etiquette for this relationship but recently, two year’s after one person’s last comment, I emailed her and hoped she’d forgive the intrusion. A couple of weeks went by with no reply and I was beginning to think the worst, so when her email came I was delighted, even overjoyed. She had taken time to reply because she wanted to consider what she had to say. In essence she’d become an Instagram fan and at the same time found that life generally had become more complicated and left her less time to keep up with the blogs she used to follow. Relieved, I was very grateful she’d bothered to reply and now I can rest easy about her – and even look at her Instagram posts too. There is now an entry in my notebook with my blog passwords so that should anything sudden happen to me my nearest can sign off my blog as they think fit – almost anything is better than just leaving it hanging. I think I should take similar steps. There is a lot that would be left hanging if I were suddenly incapacitated, and as you say, there is no etiquette for worried blog readers! Yes, I think it’s polite and even responsible to make arrangements for someone else to be able to leave final comments and wind the blog up in extremis. Dear Mary, reading your post, I was relieved to to find I am not alone in worrying if the writer of a ‘blog’ has suddenly stops writing “are they ill or have a personal tragedy” ? I too felt the deep sadness when Elspeth Thompson’s husband made the final blog post and was also a reader of “Do You Mind If I Knit’ blog which suddenly stopped posting, I hope these two wonderful diary writers knew how much pleasure they gave to us readers. I have to admit the joy I receive when you have published a new post, as I love seeing your latest projects and news., which my Husband is totally mystied about – “how a post from “invisible people” (his words) can bring so much enjoyment”? ‘shy to speak due to lack of confidence’. Please keep posting and also to other writers of similar blogs. I really enjoyed reading your comment Rosemary – thank you so much for what you say. Sometimes I suspect that we feel wanting to know why someone has stopped blogging is just plain nosy but I think this denies the peculiar and quite new relationship which blogging has brought about – after all blogging came from the idea of a web log and as such suggests a sort of open diary – not too personal but there very definitely to be read by others. I can see why your husband uses the term invisible but that’s because he’s looking at blogs from the outside. I have been surprised, from the inside so to speak, how almost everyone who leaves a comment on my blog has a very individual voice with which one feels a very direct – albeit usually short-lived – connection; a little flash of contact contributing to one’s general delight in the world. Thank you for breaking through the silence and saying such nice things! 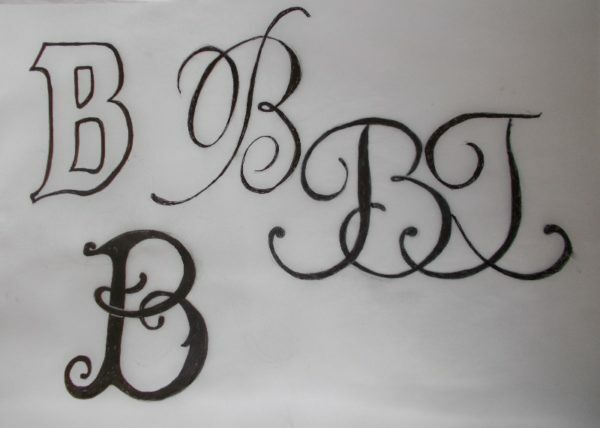 As usual, I admire the “B” and wonder whether I shall ever achieve such smoothness of technique. I totally agree with Rosemary. When after your move from Ipsden you didn’t blog for a while I fretted about you, the vicar and the cat. What a wonderful relief it was to find you all alive and well in London. Some blogs I have read in the past a spouse or child posted that the writer had died. One even posted a photograph of her mother in her coffin. Perhaps to prove it was true? Usually I would say smoothness only comes with practice but I must say I too have my bumpy periods. Although blogging handbooks always advise telling readers when you take breaks, I hadn’t realised how important this is. I never intended to stop blogging when we left Ipsden and moved to London but life just got in the way. I now know that I should have spent a bit of time thinking more clearly about this – how touching to think of you over in California fretting from time to time about the vicar, his wife and their cat. Thank you for your encouragement. 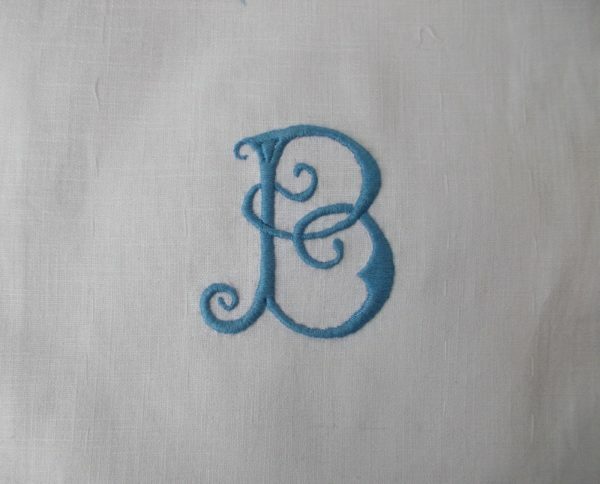 Some years ago I was inspired by your blog to monogram an apron. It lacked a certain finesse! I love what you do and mean to try again. Blogs may have fallen out of fashion but I still find them infinitely more appealing than instagram. Looking forward to the rest of the alphabet…..
How lovely to hear you’ve been inspired by my monograms – do try again, it’s always special to have something hand made with your own unique set of initials. Thank you for bothering to comment. Comforting to hear you have not abandoned reading blogs for Instagram. Dear Mary…I thought I would respond to your interesting reflection by commenting on how much I enjoy all your posts. Not only do I enjoy your thoughtful and interesting information I am a great admirer of your exquisite embroidery and creativity. Your blog is a shining beacon and I thank you for the time you put into sharing it with us. An uplifting comment, Jill and great to have such feedback. It is always lovely to hear that one’s embroidery and ruminations are enjoyed by others. Thank you. As a former blogger who has gone A3WOL I feel I should be hanging my head in shame but the truth is that there is a season for everything – including blogging. The reasons are multiple – life, as you have discovered, can get in the way, the need or the reason to blog may disappear, the mechanics more problematic as hardware changes from laptop to smartphone. I rarely open my laptop these days but commenting on blogs from a smartphone is almost impossible. Instagram suits me at this stage of my life and the majority of my former blogging community are also there so we keep in touch with each other, waving across the social media street rather than sitting down in each others kitchens. Through Instagram I have met new people and watched my friends do remarkable things in their lives. The reason I have not signed off my current blog – as I have my previous 3 blogs – is because it does not feel complete. I cannot say when I will be ready to add to it or sign off but for now there is a blank page waiting for me. I don’t read blogs as frequently these days but it is lovely to be able to pop my head around your kitchen door to say hello and thank you for thinking of me. Lovely to hear from you, again, Alice. I had tracked you on down Instagram (thank you for being not too difficult to find) greatly relieved you were still alive and bursting with enthusiasm albeit in a different medium. I didn’t mean to make anyone feel bad about moving on – but perhaps you could add a footnote to your last blog post directing us to your Instagram posts (account, posts, photos – I don’t even have the right vocabulary!). I hadn’t thought how difficult it might be commenting on a blog from a smart phone, so that’s interesting to know. Meanwhile, thank you so much for popping in an putting me in the picture. I am sending the link as I thought you’d like to see how traditional your children’s fair isle sweaters are. I also admire the shetland lace haps and shawls but do not think I’d have the patience to contemplate making and finishing one of these beautiful items. How nice to hear from you, Christine. I suppose it’s ironic really that your comment should be lost on a blog post about blogs left hanging! Thank you for trying again – it’s easy to feel a bit snubbed and think you can’t be bothered trying again. Thank you for the link to the knitting blog. It looks interesting and I shall be sure to return to it for a more lengthy amble through. I agree with you about the shetland shawls. I still have ones my first husband’s grandmother made for our children. I have let my own daughter use them for her little girl but have brought them home to be washed and stored for the next baby – see http://www.addisonembroideryatthevicarage.co.uk/2017/05/10/something-old-knitted-baby-shawls/. Ooh yes, feeling that sting! I distinctly remember the stab of sadness I felt when you said you were moving away from Ipsden, amd that your regular posts documenting your lovely church biscuits (on so many beautiful Anthropologie and Emma Bridgewater plates) would be ending, as well as all the other village events and agricultural goings on, observed in your gentle prose. Thank you for your interesting comment, Penny, which is valuable for saying something I haven’t heard anyone else say. I feel I should get on to Instagram but fear for the time it might take up (both posting and looking at other’s posts – are they even called posts on Instagram?). At the moment I’m quite happy with blogging and don’t have time to get into something new, although when the altar frontal is finished I have an idea for a regular second post a week. Glad there is still someone who likes reading as well as looking! Thank you very much for keeping in touch. Ummm no, though I am trying to work them in somehow!